The kris is the most famous Moro weapon. Variations are found in every Moro tribe and it was a key symbol of a man’s status and rank in society as well as being a powerful talisman. 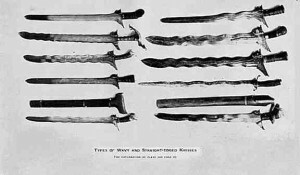 Kris blades are wide at the base, double-edged, and can be waved, half-waved half-straight, or straight (straight blades were more practical in combat). Older kris had fewer waves and the waves were deeper and wider. Over time the waves became shallower, tighter, and more numerous and therefore required greater skill to prevent the blade bouncing off or being stuck in an enemy’s body. The higher number of waves meant the more potent the kris was in talismanic power. Sometimes engravings (often filled in with brass or silver inlay) are found on the blade in plant motifs (vines, foliage, etc.) or Arabic script. Many kris blades are forged with fullers. Moro kris are cutting and slashing swords versus the stabbing keris of the Malay and Indonesians. Kris range from 45 to 65 centimeters (18 to 26 inches) in length. Older kris before the 19th century tended to be smaller in size. Laminated steel patterns are sometimes evident. Opposite the hook like fretwork on the guard of the blade is a cavity in the form of an elephant, eagle, or mouth of a naga (a mythical snake). The kris or keris is an asymmetrical dagger indigenous to Indonesia, Malaysia, Singapore, Thailand and Brunei. It is known as kalis in the southern Philippines. The kris is famous for its distinctive wavy blade, but many have straight blades as well. Both a weapon and spiritual object, kris are often considered to have an essence or presence, with some blades possessing good luck and others possessing bad. The origin of the word kris derived from the old Javanese term ngiris which means to stab, wedge or sliver. “Kris” is the more frequently-used spelling in the West, but “keris” is more popular in the dagger’s native lands, as exemplified by the late Bambang Harsrinuksmo’s popular book entitled Ensiklopedi Keris (Keris Encyclopedia). Two notable exceptions are the Philippines, where it is usually called kalis or kris, and Thailand where it is always spelled and pronounced as kris. Other spellings used by European colonists include “cryse”, “crise”, “criss”, “kriss” and “creese”. Kris were worn on a daily basis, especially when travelling because it might be needed for self-defense. Heirloom blades were handed down through successive generations and worn during special events such as weddings. Men usually wore only one kris but the famous admiral Hang Tuah is said in the Hikayat Hang Tuah to have armed himself with one short and one long kris. As women were also permitted to learn silat, they sometimes also wore kris, though of a smaller size than a man’s. 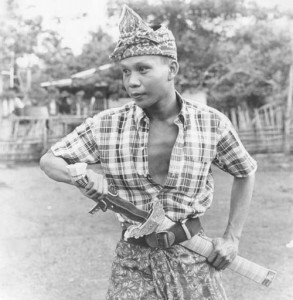 In many parts of Indonesia, the kris was the choice weapon for execution. The executioner’s kris had a long, straight, slender blade. The condemned knelt before the executioner, who placed a wad of cotton or similar material on the subject’s shoulder or clavicle area. The blade was thrust through the padding, piercing the subclavian artery and the heart. Upon withdrawal, the cotton wiped the blade clean. Death came within seconds.